This post is sponsored by The Wreath Depot. I love wreaths. But I especially love them in the Autumn. 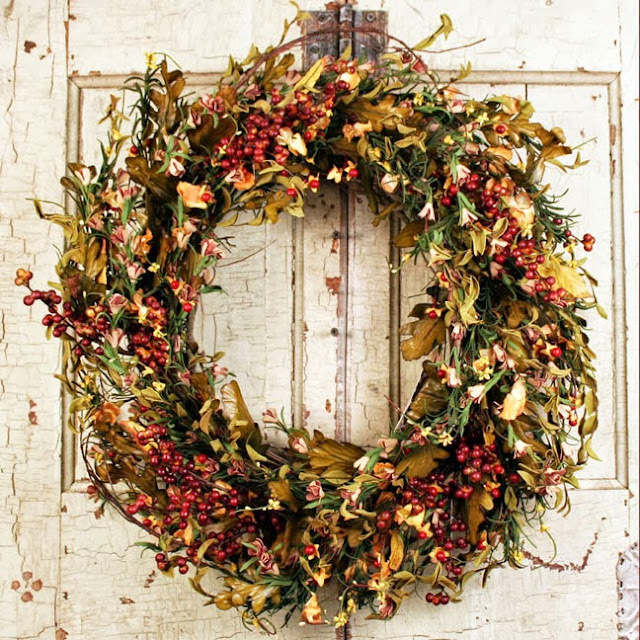 Just looking at a fall wreath makes me nostalgic and conjures up images of hayrides, Thanksgiving dinner and sitting by the fire in snuggly sweaters. I'm not sure exactly why they have this effect on me, but it is real...and poignant. So when I was contacted by The Wreath Depot to see if I would be willing to review one of their wreaths, I jumped at the chance. 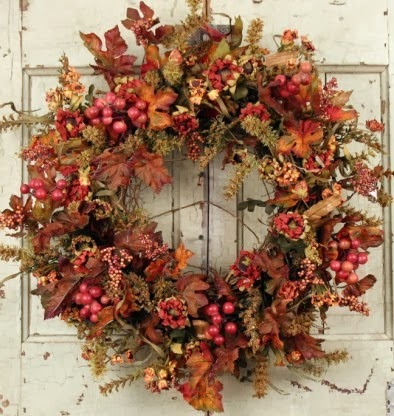 They have a fabulous selection of both real and silk wreaths for every season and holiday. 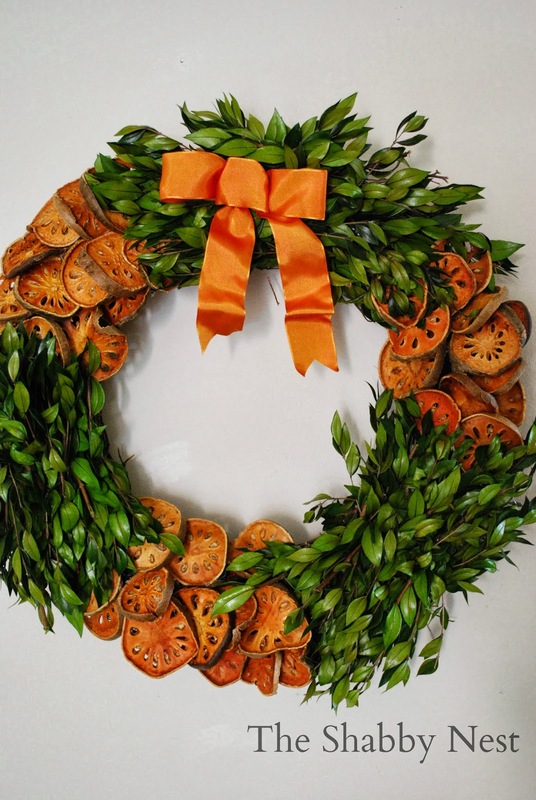 But, of course, we're talking Autumn wreaths today, so I want to share a few of their door wreaths with you. This first one is called the Valencia Red Berry Wreath. And this one is called the Gianna Fall Door Wreath...I love this one because it reminds me of a garden with fallen leaves. And finally the Maple Leaf wreath which has cute little squash tucked into it's branches. Now, although I adore these wreaths, and really wanted a wreath for my front door...I live in a VERY windy area, so I opted to choose a wreath for indoors. The one I chose is called The Quince Delight. Here it is on my wall. It's so pretty with dried quince and preserved myrtle leaves. And it smells spicy, which I love! The colors really are as vibrant as they appear in the photo....I didn't retouch it at all! It's just amazing. 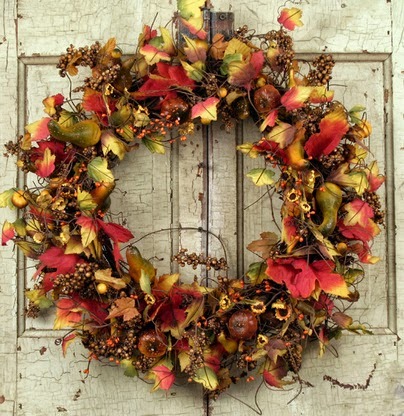 If you love fall wreaths like I do, you might want to take a peek at the wreaths Wreath Depot has to offer. And it's not too early to think about Christmas either. Just sayin'. I received a wreath from Wreath Depot in exchange for this post, but the opinions expressed are 100% mine. Oh wow that is beautiful! All of them are!